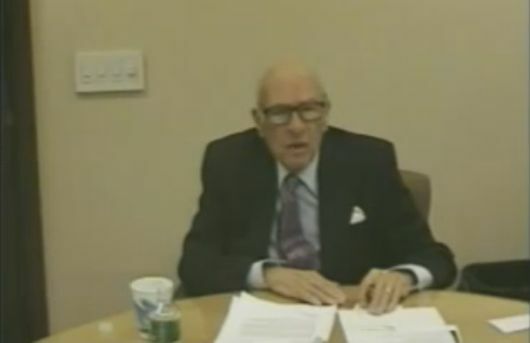 One of our favorite investors here at The Acquirer’s Multiple is Walter Schloss. Schloss was one of the most respected value investors ever to have lived, and is included in Buffett’s list of Superinvestors. He was a disciple of the Benjamin Graham school of investing. He didn’t attend college but took investment courses taught by Graham at the New York Stock Exchange Institute. Fortunately for us he wrote a number of articles over his investing life, one of which was The Hippocratic Method In Security Analysis. It’s a must read for all investors. “The first element of that method is hard, persistent, intelligent, responsible, unremitting labor in the sick—room, not in the library; the complete adaptation of the doctor to his task, an adaptation that is far from being merely intellectual. The second element of that method is accurate observation of things and events; selection, guided by judgement born of familiarity and experience, of the salient and the recurrent phenomena, and their classification and methodical exploitation. If we give our imagination a little rein we can develop systematic analogies between the work of the physician and that of the analyst . We can set off the client, with his cash resources and his security holdings, good and bad, against the patient with his constitution and his physical vigors or aliments. This suggests that the typical doctor who ministers only to the sick is fulfilling but a part of his function, as would a security analyst who was consulted only when investments went wrong. The full duty of the physician as of the analyst, should be to assist the patient—client to make the most effective use of all his resources — in one case physical, in the other financial. Is not this at bottom what the security analyst does, or should do, with respect to the stock or bond issues he examines? He must judge whether they are good risks at going prices; or conversely, name the price at which they would be good risks. Both the physician and the analyst must consider a host of factors in arriving at these judgments; they must expect unforeseeable events to play hob with some of them; they must rely on sound methods, experience and the law of averages to vindicate their work. We have pursued our analogies farther than is prudent, in order to gain a better hearing from security analysts for the Hippocratic method. The first element listed at the outset — “unremitting labor in the sick—room” — we shall concede is followed by our responsible analysts. We do work hard and persistently; we do gain our knowledge of securities at first hand — in the board room, if not in the sick room. It is the second and third steps that invite our self—critical attention. To what extent do we address ourselves to the “classification and methodical exploitation of the salient and recurrent phenomena”? Of this we have as yet only the rudiments. Very little effort has been made to construct systematic inductive studies of our experience with various types of securities, or security situations. The experience we draw upon in forming our judgments is largely a matter of rule—of—thumb, of vague impressions or even prejudices, rather than the resultant of many recorded and carefully studied case histories. Do higher yielding bonds or stocks show better over—all results than low yielders? Are (statistically shown) upward earnings trends reliable enough to warrant the payment of substantial price premiums? Are the mathematical odds in favor of low priced stocks (in normal markets) sufficient to warrant giving preference to this group? Can the near term earnings outlook be used soundly as a primary basis for common stock selection? and countless others. It is amazing to reflect how little systematic knowledge Wall Street has to draw upon as regards the historical behavior of securities with defined characteristics. We do, of course, have charts showing the long term price movements of stock groups and of individual stocks. But there is no ready classification here except by type of business. (An exception is Barron’s index of low priced stocks). There is the continuous, evergrowing body of knowledge and technique handed down by the analysts of the past to those of the present and the future? When we contrast the annals of medicine with those of finance, the paucity of our recorded and digested experience become a reproach. There are explanations and answers in rebuttal. Security analysis is a fledgling science; give it ( and the Analysts Journal) time to spread its wings. Contrariwise, many of us believe, perhaps unconsciously rather than consciously, that there is not enough permanence in the behavior of security patterns to justify a laborious accumulation of case histories. If physicians and research men keep on investing cancer, they will probably end by understanding and controlling it — because the nature of cancer does not change during the years it is being studied. But the factors underlying security values and the price behavior of given types of securities do suffer alteration through the years. By the time we have completed the cumbersome processes of inductive study, by the time our tentative conclusions have been checked and counterchecked through a succession of market cycles, the chances are that new economic factors will have supervened — and thus our hard won technique becomes obsolete before it is ever used. That is what we may think; but how do we know whether, or to what extent, it is so? We lack the codified experience which will tell us whether codified experience is valuable or valueless. In the years to come we analysts must go to school to the older established disciplines. We must study their ways of amassing and scrutinizing facts and from this study develop methods of research suited to the peculiarities of our own field of work. So, too, in security analysis, we need theories which stem from experience and close observation, but which are appropriately limited in their scope and modest in their pretensions. We must steer a middle course between starry eyed doctrinairism on the one hand and vacillating opportunism on the other. It is precisely this judicious admixture of the theoretìcal and the practical approach which characterizes the truly successful security analyst— and the outstanding physician.